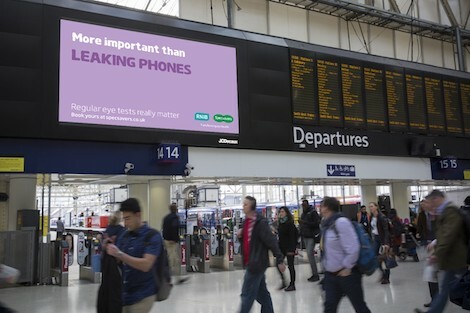 To promote the importance of regular sight tests for maintaining and protecting eye health, Specsavers has launched a tactical digital OOH campaign ahead of National Eye Health Week. The ‘More important than’ campaign leads on topical one liners that react to some of the more trivial news stories, TV gossip and what’s trending, and remarks that regular eye tests really matter. It follows research from Royal National Institute of Blind People (RNIB) and Specsavers that at least 50% of all sight loss is avoidable. The campaign runs predominantly on roadside screens, alongside rail, across 12 UK cities from September 11-25, 2017. ‘More important than’, which is being created in-house by Specsavers Creative and produced by Grand Visual, is a departure from Specsavers’ long running much-loved ‘Should’ve Gone to Specsavers’ concept. 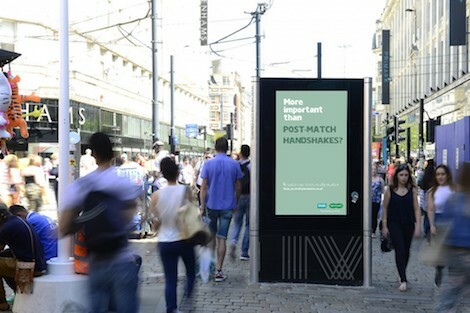 Instead, reactive, contextual and locally relevant copy lines pose suggestions like: “More important than leaking phones” and “More important than post-match handshakes”. The statements are followed by the call to action to book an eye test (here). Graham Daldry, Creative Director at Specsavers, said: “This is a new direction for us and a renewed focus on being fresh and topical while focusing on a coherent campaign that delivers across all of the digital touchpoints. By piggy backing off the current news and gossip we can deliver a targeted and engaging campaign with local relevance to make sure our important message for maintaining eye health cuts through”. Manning Gottlieb OMD, and supports a broader campaign serving topical updates across print, digital, and social channels throughout the course of the day. This entry was posted on Tuesday, September 12th, 2017 at 06:28 @311 and is filed under DailyDOOH Update. You can follow any responses to this entry through the RSS 2.0 feed. You can leave a response, or trackback from your own site.